Thiamine is a water-soluble B vitamin, that has an effect on your brain, muscles, and cardiovascular system. A thiamine deficiency can lead to weight loss, along with memory loss, confusion, muscle weakness, and heart issues. 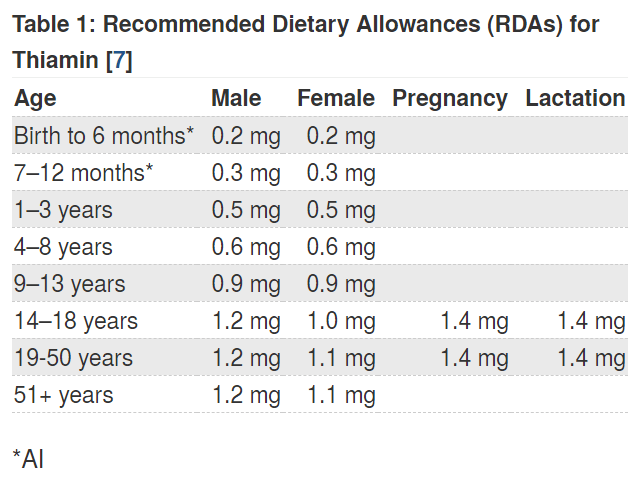 The recommended daily allowance (RDA) of thiamine is 1.2 mg for males, and 1.1 mg for females. There’s no upper limit, as your body flushes any extra thiamine through your urine. Some of the “best” sources of thiamin are animal products, so it’s harder to get on a vegan diet. However, there’s still many vegan foods that have a significant amount of thiamin. Using the USDA’s database, I retrieved the amount of thiamin in over 120 vegan whole foods. Below is a table of the top 30, in order from best per serving to worst. Certain grains are excellent sources of thiamin. Oats are the best per serving, and rye grain isn’t much lower. Legumes – Multiple types of beans (navy, black, soy, kidney), as well as lentils, peas, and peanuts are all in the top 15 vegan foods. Beans have a great amino acid profile and are a great source of plant-based protein. Nuts and seeds – Macadamia and pistachio nuts are both in the top 5, and multiple types of seeds show up on the list (sesame, flax, hemp). If you’re watching your calories, oats, seeds, and legumes might not be your best choice for thiamine. Instead, here’s a list of the best vegan foods for thiamin per 100 calories. Other than flaxseed and peas, almost every other top food from the top chart fell off this list. These foods have more thiamin per calorie, the catch is just that you’ll have to eat multiple servings to hit your RDA. Almost all of the foods in this table are vegetables, with multiple leafy greens (spinach, watercress, lettuce, kale, etc.) near the very top.